Eureka Telegraph Instrument. Manhattan Electrical Supply Company MESCO. Circ 1897 – 1915. The following advertisement from The Journal of the Telegraph dated 20th November 1904 describes. The Eureka is a first class, full size telegraph set. All the working parts are finely finished composition metal, such as used in all high grade instruments. The base is mahogany and highly polished. The key is of the steel lever pattern. A book of instructions for amateurs is furnished gratis with each instrument. The above example has a standard British / European knob that was supplied with sets for export. This was advertised for sale by Gamages in 1913 with a price of 9 /- and postage of 5d. This Key on Board Telegraph Learner Set by Signal Electric Manufacturing Co of Menominee Michigan and distributed by Central Scientific Company was advertised in the Signal Electric Catalogue of 1941 and designated as a M-110 which was the 4 Ohm version and priced at $5.75 with the 20 Ohm version, the M-111 being priced at $6.00. It was described as having a bar frame and key base of black enamel, the bridge of brass, sounding bar of aluminium with black lacquered steel sounder plate. Key lever is nickel plated and the key and sounder being based on a mahogany finish wood base. Central Scientific Company was founded in 1900 in downtown Chicago. It was formed out of what was left of the Olmstad Scientific Company. Central Scientific manufactured and distributed science teaching equipment for schools, colleges, and universities by catalog mail order. The trademark "CENCO" was used from 1909 onwards. CENCO dominated the field of selling science education equipment through their mail order catalog. By 1935, the company established itself as one of the leading national suppliers of science equipment. During World War II, part of the manufacturing facility was turned over to the production of war necessities, making bombsights for airplanes and fuses for large bombs. After 1968, the company began having financial difficulties. In 1974, the assets were sold off to competitors. The educational business retained the name Central Scientific Company. In April 1979, Central Scientific's assets and activities were acquired by two businessmen from Buffalo, New York. They sold the business to Sargent-Welch (their main competitor) in 2000. 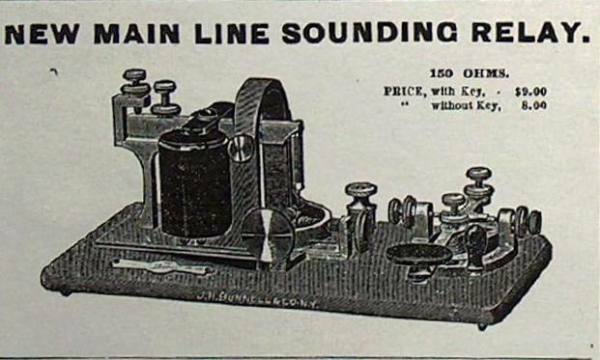 This combination set was first advertised in Jan 1882 reducing the number of line and sounder batteries required for a telegraph setup and made the first successful sensitive easily portable telegraph station. It was described in this advert as “For Main Lines up to 600 miles in length. Of best construction for loud, clear sound without local sounder. Polished Mahogany Box and Base. 150 ohms Silk Wire. Price, with Steel Lever Key on base, $12.00; without Key, $9.00”. This example carries the J.H. Bunnell bowtie label and stamped at 150 ohms. The steel lever key carries the patent date of Feb 15 1881. It is in wonderful condition with patina to die for, an almost perfect example in fully working condition, only the spring and tension cord has been replaced. A Combination Telegraph Set with Barclay Box Sounding Relay and Steel Lever Key J.H. Bunnell circ 1907. This combination Telegraph Set is similar to the one above but has a sounding relay of a modified design by John C. Barclay. Barclay looked at the conventional box relay being used and improved this design by using a shallow brass box with a wooden diaphragm making it similar to a snare drum. The "drum" was attached on its side to the instruments base with the magnets partially enclosed, making them accessible instead of being sealed as in the old box relays. The openings for the magnets also helped to port the sound away from the "drum." To increase the striking effectiveness of the lever, he used steel instead of platina (platinum) contact points and selected hard maple instead of cherry or mahogany for the diaphragm. Barclay's Box Relay was produced in two configurations. The most common was the relay with a key on the same base, but it was also available without the key and used as a stand- alone relay/sounder. Two wiring options were available for each. In one, four binding posts were included, just like in a conventional Morse relay, two for connecting the magnets in series with the main line and two for utilizing the relay's normally open SPST (single-pole/single-throw) contacts. The later being an option if a local series circuit consisting of a battery and sounder was to be driven by the relay. The other option was just two binding posts for the magnets. Barclay favoured eliminating the two binding posts associated with the relay contacts. He felt if the box relay was truly efficient, "it will do the work expected of it" and not require the local circuit. For dating purposes, Barclay's Box Relay was introduced in 1903 and The Bunnell Telegraphic and Electrical Company had exclusive rights to it. Barclay Box Relays with "Bunnell Tel. & Elec. Co." markings are the most uncommon, as that company was in the process of merging with J.H. Bunnell & Co. that year. His Box Relay was manufactured for several years by Bunnell and even today makes for an ideal portable or demonstration piece. This unit's overall dimensions are 5.5 x 9.5" with a height of 3" for the sounding box. Not many of these were made so are highly sought after by collectors. The above image to the right shows as it was found, the others after it had been lightly cleaned revealing what was underneath years of dirt. This is a nice example of the classic “Beeko” key and sounder combination practice set. It is manufactured and marked L.E. Knott Apparatus Company of Boston and manufactured around 1905 although this company was active from 1896 to the start of the 1930’s. On the base it is stamped “Patented” but I believe that this must be the overall design of the “Beeko” key and sounder and not the combination set itself as I know of three versions of this set. One marked by J.H. Bunnell, one marked MESCO and this one, probably the scarcest of the three and all manufactured under licence of the patent holder. The overall design of both the sounder and key was patented by Gustave A Zundel and designated Patent No 770,549, dated September 20 1904. The design is based around the idea of manufacturing a cheap and durable supporting frame being especially desirable for the cheaper grades of instruments, such as learner sets. Although many thousands of these were made, because they were sometimes treated as toys due to their construction, many were discarded which now makes them scarcer to find for collectors. This set works really well, it is complete and in fully working condition. The New Main Line Sounding Relay by J. H. Bunnell & Co gives more than three times the volume of sound given by the very best Box Relays or any other form of sounding relays for short or long main lines ever before produced. They are unequalled for Wrecking Instruments, Testing Sets, Switchboard Sets, Temporary Offices and all places where it is desirable to dispense with the use of Local Batteries. These instruments are made with full size relay magnets of 150 ohms resistance, having both magnet and armature adjustments and fully suited for doing, in a greatly improved manner, the work of regular main line box relays. They are highly sensitive to the weakest currents and will give a clear working sound on circuits where, without them, a relay with local sounder and battery would be absolutely necessary. This unit would be capable of working circuits from a mile or two up to 100 miles when with ordinary main battery power suitable for such lines they are equal to the best local sounders. Price of 150 ohms resistance with key on base - $9.00. Price of 150 ohms resistance without key - $8.00.